It is widely recognized that analytical technologies and techniques are playing a pioneering role in a range of today's foremost challenging scientific endeavours, including especially biological and biomedical research. Worthy of mention, for example, are the role that high performance separation techniques played in mapping the human genome and the pioneering work done within mass spectrometry. It is also apparent that state-of-the-art pharmaceutical and biomedical research is the major driving force of the development of new analytical techniques. Advancements in genomics research has provided the opportunity for a call for new drug targets for new technologies, which has speeded up drug discovery and helped to counteract the trend towards inflation of R&D costs. 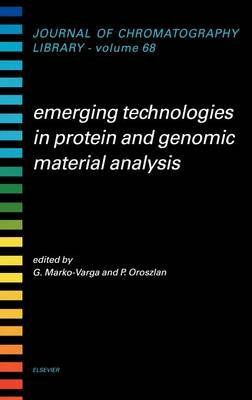 This book has been designed to be a reference covering a wide range of protein and genomic material analysis techniques. Emerging developments are presented with applications where relevant, and biological examples are included. It was developed to meet the ever growing need for a comprehensive and balanced text on an analytical technique which has generated a tremendous amount of interest in recent years. In addition, this book also serves as a modern textbook for advanced undergraduate and graduate courses in various disciplines including chemistry, biology and pharmacy. Authors of the individual chapters are recognized champions of their individual research disciplines and also represent contemporary major research centres in this field.